extended Freedom Town section: Tony in a phone booth trying to call his sister Gina; Angel looking in a phone book for his brother Pablo; extended conversation between Tony and Manny about getting out of Freedom Town; Tony and Manny watching television. Tony's first visit to his mother's house is longer. Tony opens a bottle of champagne and makes a toast to America. when Alberto is planting the bomb under the car in N.Y., Tony sees cops nearby and distracts them by pretending to be looking for his missing dog. Q: How could Tony take so many shots and still be standing in the final gunfight? Every great gangster movie has under-currents of human drama. Don't expect an emotional story of guilt, retribution and despair from "Scarface". This is a tale of ferocious greed, corruption, and power. The darker side of the fabled "American Dream". Anybody complaining about the "cheesiness" of this film is missing the point. The superficial characters, cheesy music, and dated fashions further fuel the criticism of this life of diabolical excess. Nothing in the lives of these characters really matter, not on any human level at least. 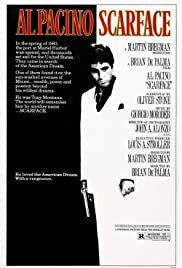 In fact the film practically borderlines satire, ironic considering all the gangsta rappers that were positively inspired by the lifestyle of Tony Montana. This isn't Brian DePalma's strongest directorial effort, it is occasionally excellent and well-handled (particularly the memorable finale), but frequently sinks to sloppy and misled. Thankfully, it is supported by a very strong script by Oliver Stone (probably good therapy for him, considering the coke habit he was tackling at the time). 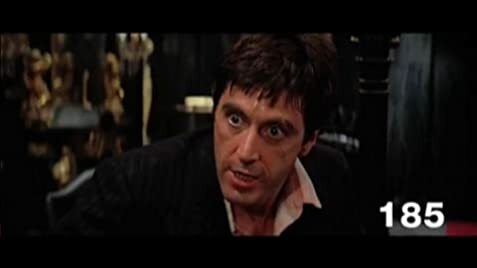 The themes are consistent, with the focus primarily on the life of Tony Montana, and the evolution of his character as he is consumed by greed and power. The dialogue is also excellent, see-sawing comfortably between humour and drama. There are many stand-out lines, which have since wormed their way into popular culture in one form or another. The cast help make it what it is as well, but this is really Pacino's film. One of his earlier less subtle performances (something much more common from him nowadays), this is a world entirely separate from Michael Corleone and Frank Serpico. Yet he is as watchable here as ever, in very entertaining (and intentionally over-the-top) form. It is hard to imagine another Tony Montana after seeing this film, in possibly one of the most mimicked performances ever. Pfeiffer stood out as dull and uncomfortable on first viewing, but I've come to realize how she plays out the part of the bored little wife. Not an exceptional effort, but unfairly misjudged. The supporting players are very good too, particularly Paul Shenar as the suave Alejandro Sosa. 334 of 399 people found this review helpful. Was this review helpful to you?